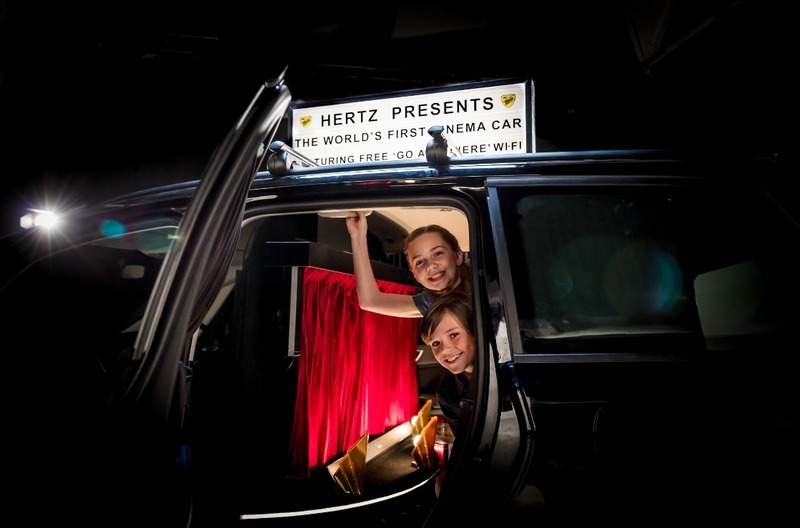 Hertz has pulled back the curtains on a world first – the Cinema Car. 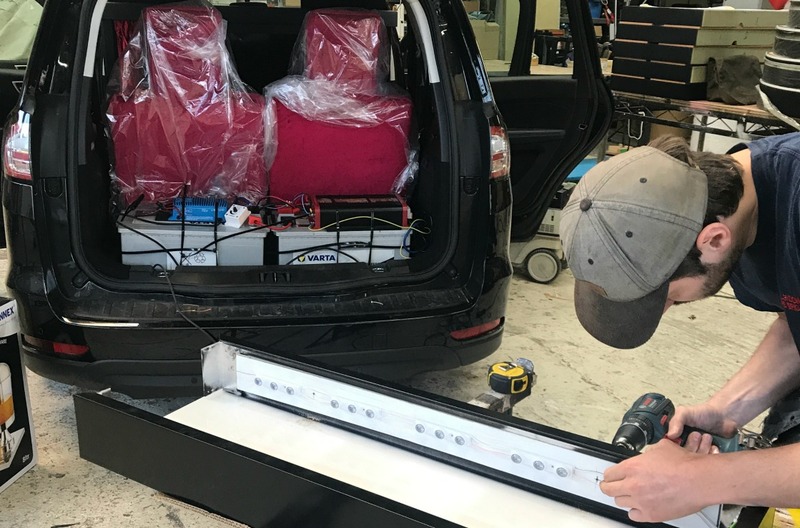 Six bespoke Ford Galaxy MPVs have been transformed by our team of top designers. Gone are the middle-row seats, in comes cinema-style seating, vast legroom, a huge screen and a state-of-the-art sound system. And best of all, no one will shush you for daring to rustle your popcorn. 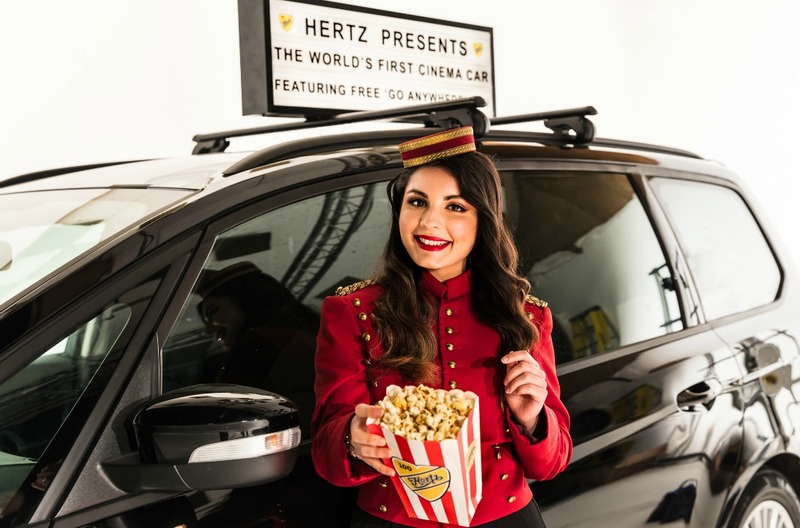 At the heart of each car is Hertz Connect – the ‘Go Anywhere’ device that gives customers unlimited Wi-Fi on-the-go, allowing them to access entertainment including their favourite films for passengers to watch on the move*. In choosing the design for the Hertz Cinema Car, we drew on Art Deco-inspired luxury. The seats have been reupholstered in red velvet and the gigantic 50-inch screen is revealed by the opening of automated curtains. The timber armrests come complete with cupholders, while golden shell uplights complement the cosy ambient lighting. And all of it has been hand-built by a seven-strong team of experts. The team started with some simple drawings, before the real design and development began with the delivery of the first Ford Galaxy to their London workshop. “It’s been a fun job,” says Ian, whose favourite feature is the ambient lighting, which – when the black-out blinds are lowered – fills the cabin-turned-cinema with a soft glow, creating a perfect movie-watching environment. At the end of it all, the team will have to undo all their hard work and return the cars to normal. “We’ll recycle everything that can be recycled,” explains Ian. And as for the TVs and soundbars, they’ll be donated to charitable causes. But before then, surely someone needs to test it all out – what would Ian watch? “The Incredibles with my two boys and my wife”, he says. Good choice. *Films are streamed via the customer/passenger’s own personal streaming-service accounts (subject to their account’s terms and conditions). Need some film inspiration? Here are our top 10 car movies. 1. The Italian Job – the original, of course. British ingenuity, cheek and charm abound in this classic featuring Michael Caine, a fleet of iconic (and expertly driven) Mini Coopers, and the most literal and figurative of cliffhangers in film history. 2. Gone in 60 Seconds – with his brother in trouble, Randall Raines (Nicolas Cage) has to lead a team in stealing 50 cars in 72 hours, otherwise his brother will be killed. The hero car is Eleanor: a 1967 Shelby Mustang GT500. Turn up the volume and enjoy. 3. The Spy Who Loved Me – for all the expensive gadgets elsewhere in the franchise, this 1977 James Bond classic contains the most memorable of all – the white Lotus Esprit that transforms into a submarine at the touch of a button. 4. Baby Driver – this recent hit is worth watching for the stunt driving performances alone. Baby (played by Ansel Elgort) is a music-loving driving master behind the wheel. Trying to pay off his debts, he gets embroiled in a world he needs to escape, but he’ll have to drive his way out first. 5. Bullitt – the classic car chase, full of skill and suspense, is regularly hailed the best ever committed to celluloid. Steve McQueen, driving a Ford Mustang GT, is pursued by two hitmen in a Dodge Charger, before becoming the hunter. The epitome of cool. 6. Climb Dance – this short film is one that makes you think “I couldn’t do that.” Beautifully shot, watch in awe as former World Rally Champion Ari Vatanen storms his way up the world’s most famous hill climb, America’s Pikes Peak. 7. Le Mans – Steve McQueen stars again in this 1971 film of the world’s most famous and prestigious endurance race, the 24 Hours of Le Mans. Footage was recorded from a car entered into the 1970 race – so while the plot may be fictional, much of the racing is the real deal. 8. Rush – a biographical film covering one of Formula 1’s greatest rivalries between Nicki Lauda and James Hunt. Visually spectacular and with a captivating – and real – storyline, this is an insight into the golden days of glamour in Formula 1. 9. Senna – this feature-length documentary isn’t just for racing fans. Through archive footage and contemporary interviews, director Asif Kapadia tells the story of arguably the most gifted racer in history – and how it all came to a tragic, heartbreaking end. 10. Cars – one for all the family, Cars follows Lightning McQueen’s fall from fame, and his rise again. There are delightful characters, moments of sublime wordplay, and incredible animation. The rest of the franchise is well worth a watch, too.